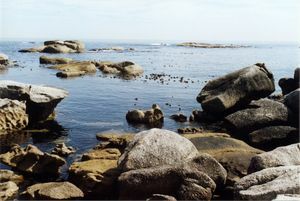 The dive site Groot Pannekoek is a inshore rocky reef in the south Oudekraal area on the Atlantic seaboard of the Cape Peninsula, near Cape Town in the Western Cape province of South Africa. 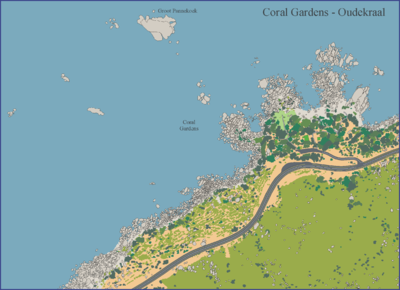 Map of the dive sites at Coral Gardens and Groot Pannekoek. The name "Groot Pannekoek" means Large Pancake, and refers to the shape of the rock and compares it with the nearby rock of similar shape known as Klein Pannekoek. No records available, Maximum depth near the rock probably about 15m. Huge outcrop of Peninsula Granite corestones, Some overhangs, crevices and small caves. Geology: Late Pre-Cambrian granite of the Peninsula pluton. Best after South Easterly winds (offshore). The swell should be low, though a bit of white water on the outer reefs is normal. 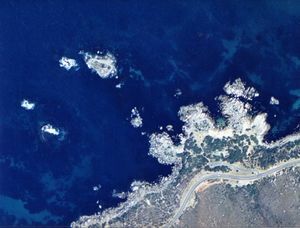 The dive site is exposed to the South West swell, This is a site where good visibility is usually accompanied by cold water. There is usually some surge, and it can be quite strong. The site is usually at it's best in summer but there are also occasional opportunities in autumn and early winter. Reasonably secure off road parking, clean toilet facilities, fresh water on tap at the parking lot and a fresh water shower at the beach. Picnic areas with tables, seating and usually shade. A shore dive for the fit diver. It entails a surface swim of about 270m to a group of offshore rocks after a moderately long and fairly steep walk to the entry point, along a good set of paths and stairs at the Oudekraal TMNP recreation area. Alternatively a boat dive: It is 14km from Hout Bay, or 14km from Oceana Power Boat Club. Shore dive: Use the Table Mountain National Park Oudekraal parking lot off the coast road if there is space. You pay for the parking but the facilities are good, including clean toilets, picnic areas, shade trees, and showers. Security is better than most places. Alternative parking is available at the side of the M6, but the walk is longer and security not as good. Go down the stairs at the west end of parking lot and straight across the grassy area to the rocks at the Westerly cove. There is a bit of a rough clamber over the rocks from the bottom of the path to the entry area which is usually quite a placid spot as it is well sheltered by reefs a few metres out, and heavy kelp, which is easier to negotiate if the tide is high. The long climb down the stairs and the clamber over the rocks require a reasonable level of fitness, but there is fresh water on tap at the top of the stairs and a few litres on your head and suit before the descent will keep you cooler. There are kelp forests and a good variety of invertebrates on the rocks. Cold water, Strong surge and breaking waves over exposed rocks. Sea urchins. Strong offshore winds may develop over a short time. Access to entry/exit point over large boulders. The site requires fitness if dived from the shore There is no particular minimum qualification recommended, but this is a site for the reasonably experienced diver. Ability to navigate back underwater is recommended if there is a south east wind forecast. A compass is recommended to help navigate back from shore entry dives in case an offshore wind comes up during the dive. This page was last edited on 25 September 2012, at 16:56.